Well it’s been a few days since the mural adorning the faces of 157 fallen young Canadian soldiers, servicemen and aircrew came to our town. As the national & local Chair of the project, I was more than aware of the intent of the Portraits of Honour and the intended impact. What I could never imagine is the overwhelming feeling of pride throughout the weekend! We started with sixty motorbikes escorted by flashing police lights roaring into town Friday afternoon. On their Harleys, SGT (Ret’d) John F. Moreland CD and Master Corporal Chris Downey led the Portraits of Honour procession from Cold Lake into Fort McMurray to begin this powerful weekend of remembrance; honouring and celebrating the lives of our fallen soldiers. Friday evening was the Private reception for sponsors, community leaders and Veterans, family members of Canadian Forces personnel and of course Kinsmen and Kinettes. It was an emotional evening with the parents of fallen soldier Lieutenant Justin Boyes sharing their journey of loss and healing. Dave Sopha praised the sponsors, Kin Canada, and volunteers and spoke to the families of the fallen. Master Corporal Chris Downey was probably the toughest person to listen to due to the raw and emotional message he had to deliver! The food, mood, attendees and message made this a very special night! “One of the classiest evening I’ve been to in a long time” was one quote. Bright and early Saturday morning, the Fire Fighters hosted breakfast for the community. Hot coffee and pancakes kept the crowd warm until the moving Dedication Ceremony at 10:00 AM. 157 Canadian flags flapped in the breeze making a breathtaking impact against the clear blue morning sky. The flags, emblazoned with the name of each fallen soldier, were a solemn reminder of our losses sustained in Afghanistan. The dedication ceremony was another opportunity for Fort McMurray citizens to experience the amazing connection with those who paid the ultimate price for our country, and hear messages of hope, loss, healing and remembrance. I believe a quote from one of the people in attendance sums up the stop and POH as a whole; "I have been to the Calgary Olympics and never missed a Remembrance Day ceremony, but I have never been prouder to be a Canadian than today. This really made me realize how important it is to be Canadian." For those who saw Master Corporal Chris Downey speak, you will know that he was critically injured in an IED attack that claimed the life of his comrade and friend PO2 Douglas Craig Blake. While this was an opportunity to raise funds to support families and the veterans who have sustained lasting physical and emotional injuries, more importantly, we know that the mural has touched many lives. In Fort McMurray we have a surprising number of veterans and family members of Canadian Forces members and this weekend started the healing process for some, offered closure for others, but for most who experienced the mural, it was an opportunity to feel great pride in being Canadian. From a new Canadian: ‘I just looked around on Saturday morning and saw the Mayor there with her children, and military people along with police and common citizens. In the country where I came from a politician would never take their children into public for fear of kidnapping or harm, and people would never go to a celebration for the military. In my old country people are afraid of the military. That morning seeing politicians, military, a variety of citizens, including new Canadians all together to remember the fallen soldiers made me realize why I love being in Canada. Our Speakers – Master Corporal Chris Downey and Angela and Brian Boyes. Your courage is inspiring!! We were honoured and privileged to hear your personal journeys! Brian Makey – Thanks for coming on board with a request of “hey Brian would you like to come out to a meeting about Portraits of Honour? We couldn’t have done it without you! Events Wood Buffalo – Claude, Jenn, Misty and Dan, thank you for taking us on as part of Summer’s End Festival. Your support, patience and professionalism made a big difference! The HUB – Ruth, Angie, Bonnah, Marcene & Chris, thank you for taking on the big task of coordinating the volunteers. This was a huge undertaking and you were amazing! Ruth, one of the best phone calls I’ve made in a long time! 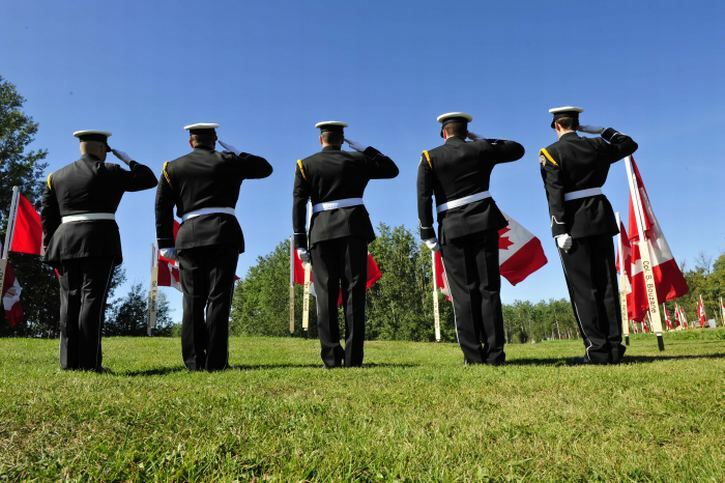 – We cannot adequately express our gratitude for the huge amount of support for our Fallen Soldiers! A special note to CJOK93.3/Rock97.9 - I will never listen to “Convoy” the same way again! Mayor Melissa – Thank you for attending both functions staying throughout both. We know your time is valuable and we appreciate your support of Portraits. Fire Fighters & RCMP – Thank you for being there for us in so many ways. The motorcade, pancake breakfast, Honour Guard and colour guard were a big part of this event. More than that, thank you for keeping us safe in our community day in and day out!! Stay safe! MacDonald Island – What can we say but Class Act! The reception was beautifully done and we received nothing but compliments! Rosenau Trucking – Thank to you f or supplying the beautiful trailer to travel with the motorcade and stay with the mural on Saturday. More than that, thank you for your amazing support of our Troops!! Councilor Mike Allen – You came in at the last moment and completed the Dedication Ceremony with an amazing “Last Post” and “Reveille”. Such a beautiful moment hearing you play from amid the flags! To our Sponsors – Without you we could not have hoped to reach the people we did this weekend. Your generous contributions had both immediate and longer term healing impacts. Thank you for doing what you do so very often with the many knocks you receive on your doors!! The Volunteers – A special thanks to the Family of Kin – many Kinsmen and Kinettes in Fort McMurray and the “behind-the-scenes” crew keeping the tour rolling down the road. On behalf of the Portraits of Honour, thank you to all the community volunteers for giving your time to make this a wonderful event! We will be downloading pictures from the weekend as well as the total amount to funds raised in the coming weeks.